Oh boy, do we love deep dish pizza. One of our old favorite places in the 80's to get deep dish pizza was 'Uno's Pizzeria. At one time there were 4 Uno's in the Bay Area. Three in the City and one in Oakland, was our choices. They are now long gone. Uno's has morphed into Uno Chicago Grill located in Antioch, California. Antioch is a growing community on the very far outskirts of the Bay Area. We were returning from the Asparagus festival and Uno's was on our flight path home. It was our duty to have an Uno special. This deep dish delight would be our ticket to a blast from the past. The Antioch Uno Chicago Grill was located in a new conglomerate of chain stores that looked like any other new community of businesses built in the last 10 years. Once inside it was kind of like any other national syndicate of franchised restaurants. This did not resemble the Uno's of our memories. Would we be dissapointed? We ordered the 'Numero Uno' pizza. This pizza has pepperoni, sausage, mushrooms and onions. It also has lots of cheese and a chunky tomato sauce. This pizza was so good. The crust was very buttery and rich just like we remembered. 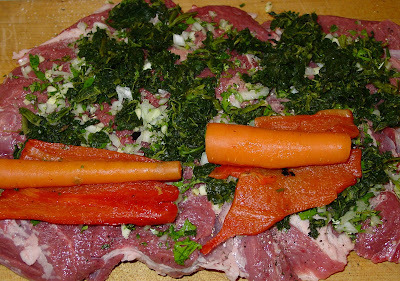 The meat and vegetables complimented each other to form a beautiful pie. This orb of meat and goodness was a stroll down the pizza memory lane. One detail of our pizza experience, that stood out, was the outstanding service we received. Our server made our visit most pleasurable. The owner stopped by our table to see how our meal was. When he found out that Ms. Goofy was in the house, he comped us a bananas foster desert. Great deep dish pizza and wonderful service was a winning combination. The Antioch Uno Chicago Grill will be a destination to return to. The best part of this class is the hands on tasting of barbeque. 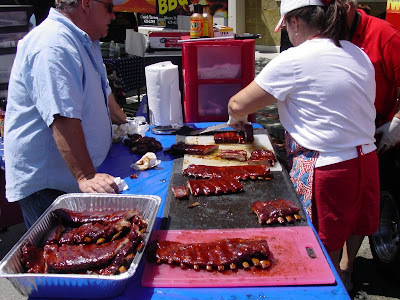 Once you have completed this class, You will be eligible to judge future KCBS competitions. Let me tell you that this is one serious fun experience. Hope to see you there. The Chilebrown Ice Cave is full of meaty delights. Tonight some elk meat and Dakota sausage will be combined to form a meat loaf. It will be blanketed by bacon from Prime Smoked Meats. This tube of splendor will be kissed by a controlled firestorm of burning mesquite embers. There is drool coming from my kisser just thinking about it. 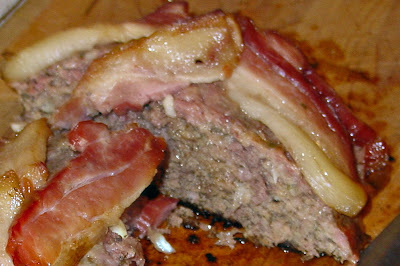 A simple meatloaf recipe is the only guideline to use. We just so happened to have a Walla-Walla onion that was grown by our neighbor. Let's start cooking. Combine all the ingredients except bacon. Form into a loaf. Place into cast iron pan. If you have a trivet, use it. Cover the loaf with bacon. A medium hot fire should be built. A sprig of rosemary and a twig of apple wood was thrown on the coals for the smoke effect. You want the temperature to be around 350 degrees. 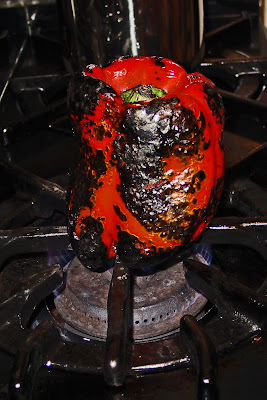 Cook for 45 minutes or until the internal temperature reaches 150 degrees. We served this with some baked potatoes and some fava beans. This was some serious good eats. Cookiecrumb: 'A lot of trouble'. Fava Beans are easy to grow. Throw them in the ground like Jack and the Beanstalk and you will have a bean pod to the castle. Blanch them, spilt them, add a little garlic, salt, olive oil and eat them. Prime Smoked Meats will be tap dancing across the stage today. This dancer is an old pro. They have been smoking meats since 1958. Sit back and enjoy the show. Prime Smoked Meats is located in an Industrial/commercial area near Jack London Square in Oakland California. They are a block away from the wholesale produce markets. When you arrive at Prime Smoked Meats, you may wonder if they have retail sales. Luckily a sign welcomes and directs you into the meat factory. You enter through a climate control door and walk directly into the meat processing plant. A pleasant odor of smoke will hit your sinuses. There is an office with a small window. You place your order and one of the butchers will return with your goods. This lack of old style butcher store ambiance is made up with price and quality. You can, "purchase premium meat products at unbeatable wholesale prices". They have great Ham. We picked up a picnic ham for Easter. We also picked up a slab of bacon for research purposes. This bacon has a great meat to fat ratio. When you unwrap your slab a wonderful smoke smell will prevail. 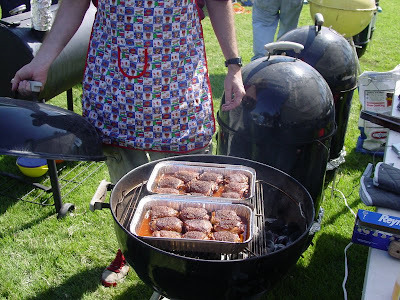 Prime Smoked Meats uses applewood smoke for flavor. Everything looks and smell wonderful so far. Oh, wait a minute. The rind is on. A sharp knife removed this transgression. A cast iron pan was used to fry this cured pork to the crispy stage. The first bite was heavenly. This bacon has great balance. Salt was present, but not overpowering. The same for smoke and sweetness. There was a nice chewiness to the meat portion of the strip. I have not even mentioned the price yet. This bacon will receive a good rating of 3.85 stars. It was very balanced. Nothing stood out and grabbed your attention on this bacon. Very good, but not a Gold Standard. 'You say tomato, I say tomatoe, Lets call the whole thing off'! * Not today! 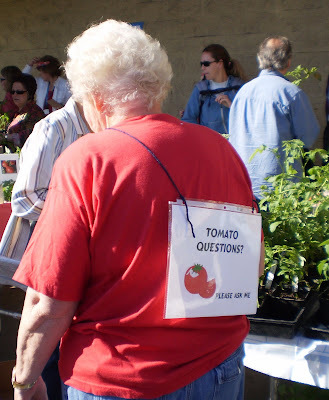 The 'Organic Heirloom & Hybrid Tomato Market' was held in Novato, California. This was the spot to purchase some new and unusual varieties of tomato. The sales went to support a program for Sustainable Garden Education. We arrived at the opening of the sale. It was a mad house. Have you ever been bowled over by an aggressive Marinite? This one highly caffeinated 'Soccer Mom' cleared a path, regardless of any crowd etiquette, to make her purchase. It is a good thing I had Ms. Goofy to block for me. There was some really great varieties of tomato's. 'Aunt Ruby's German Green, Box Car Willie and Japanese Black Trifele were a couple of varieties that were purchased. We ran into some celebrities, Zoomie & Her Beloved but no Cookiecrumb or Cranky. We took our purchases home and got Diggity! * Sorry, George Gershwin "Lets Call the Whole Thing Off"
There is a ton of sausage in the Chilebrown 'Ice Cave'. Some Bratwurst from 'Lakewood' and some jalapeno cheese from 'Swingles'. The grill is set on high with mesquite charcoal. How about some bread with these meat tubes. Okay, How about some home made bread cooked in the beehive oven. Oh man, We have so much fun!!!!. 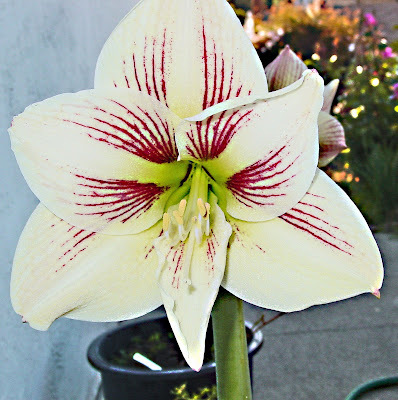 The first Amaryllis has bloomed. 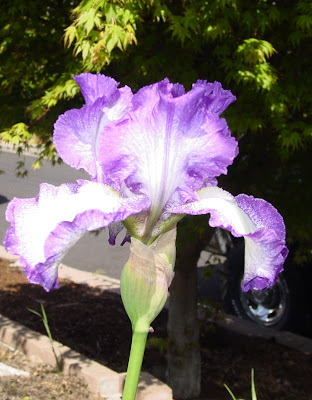 The Irises are showing their fluorescent beauty. The fava's are so plentiful that the stalks are bowing to the weight of their bounty. Spring is here. When spring has sprung, Asparagus is the vegetable of choice. All of this leads up to the 'Asparagus Festival'. The Asparagus festival is the beginning of the festival season. This celebration of the green stalks of spring has a bushel of entertainment lined up. Joey 'Jaws' Chestnut will be there to defend his record of 8.6 pounds of devouring deep fried asparagus. Martin Yan will cook up tasty dishes. The Tubes will be performing. Jaws, Yan and Waybill, how can anybody pass up this trio of talent. The best part will be the food. Asparagus ice cream, margaritas, deep fried asparagus, and much much more. Hope to see you there!!!! Easter, we got chocolate in bunny shapes. It was also the time to have hard boiled eggs in different fluorescent dyed colors.. We also went to Church. This was a special holiday. What ever memories we have, Food, plays a special part. The first Easter food item is a ham. The next is a stuffed leg of lamb. 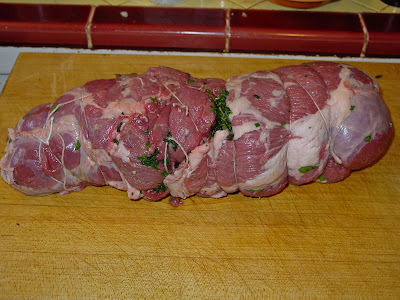 If you do not have a stuffed leg of lamb you will have to stay tuned for instructions. Take your flattened piece of lamb and salt and pepper liberally. Layer the the spinach, onions garlic. Next lay the peppers and carrots. Roll everything together. Tie with cotton string. Of course, I am using the Weber. It is an indirect fire, with Mesquite charcoal and Kingsford briquettes combo of fuel. Get a big fire going and let the coal get nice and hot. Clean your grate and oil. 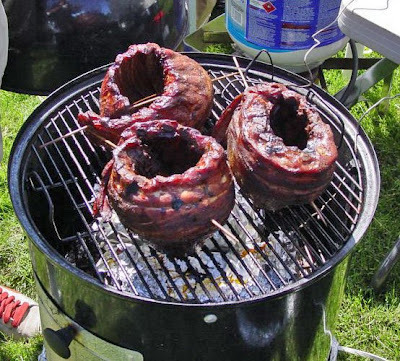 Place your meat roll in middle of grill. I have the vents all the way open to light the fire. You want to get the kettle as hot as you can. Once the meat is on the grill close the vents half way until the temperature in the Weber reaches 350. Cook until the internal temperature of the meat is 130. let rest for 15 minutes. Cut all the string away. Can you wait for 15 minutes?. It is not easy. Once you cut into this loaf of Easter you will be Happy. It is a whole meal in a slice. It was smokey and tender. The two killer combinations. We served this with rice and fava's from the garden. It does not get any better! 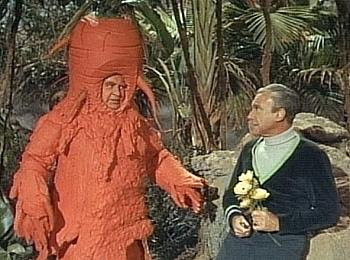 'Lost in Space', was a very entertaining TV show when yours truly was a juvenile. One episode still stands out in the memory banks of my mind. 'The Great Vegetable Rebellion' was one of my favorite chapters of these weekly adventures. 'Hulu' is a great forum to watch these wonderful old shows. The story goes like this. Dr. Smith picks a flower and is immediately accused of murder by Tybo a giant talking carrot. Tybo tells Dr. Smith he must now die. Maybe this was the beginning of my gardening fascination. Tybo has left a lasting impression on my life. This may explain things. Sit back and enjoy! 'Burn, Burn, the Ring of Fire'. I cannot help my self. This is the best song ever. June or Johnny Carter wrote this song. There have been numerous artists that have covered this song What does this mean? It is Ms. Goofy's birthday and I am going to make her a breakfast pizza. Some Schinken Speck, Asparagus and Eggs are the main ingredients on this pizza pie. How come when ever I say pizza pie, I break out into song. (Thats Amore). We are also using some chicken apple sausage from Lakewood. Sausage Co. When the moon hits your eye like a big pizza pie, Scoozza Me that's Amore! Yeah, It is Spring! These are the first Fava beans that have been harvested. 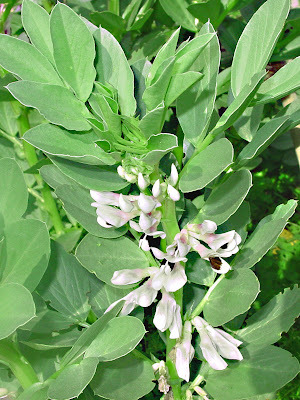 The Fava plant is very easy to grow. 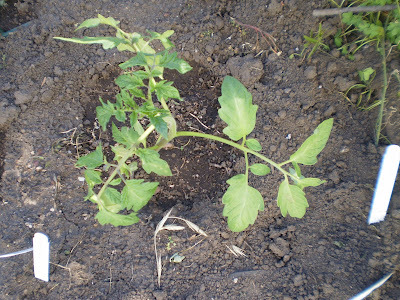 The seeds were put in the ground last November and pretty much forgotten. They are all purpose plants. They add nitrogen to the soil. The flowers are very pretty. You can eat the leaves, pods and beans. The leaves can be blanched and or cooked just like spinach. The whole pod can be eaten like a regular green bean when immature. When they are juveniles you can eat the seed inside the pod without blanching. When they are a teenager, you will need to blanch the seed to remove the membrane protecting the kernel. "It is a lot of work for what you get! (William A Brown)". When they are seniors , you can use the seed as any other dried legume. My favorite time to eat fava's is in the teenager stage. You peel the seeds from the pod. You plunge them in some boiling water for 3 minutes. Drain and cool. Pinch the seeds to peel membrane from the seeds. Place them in a bowl and add salt, olive oil and some minced garlic. Eat these beans of spring with a salad and enjoy.